The Remain-voting Prime Minister’s deal with the European Union — if ratified by the British Parliament and European Parliament — could condemn the United Kingdom to “perpetual purgatory” or even no Brexit at all, as Britain’s departure would be followed by a lengthy “transition” period in which it would remain subject to all the rules and regulations of an EU member-state, but without representation in the EU’s institutions. European Commission president Jean-Claude Juncker, EU chief negotiator Michel Barnier, Theresa May herself, and EU leaders including Dutch prime minister Mark Rutte are all claiming the agreement is “the only deal possible” — a coded and likely co-ordinated warning to Brexiteer MPs in the House of Commons who have said they will vote it down and argued for a rapid renegotiation. The Prime Minister has tried to appeal directly to the public for support in a “letter to the nation”, which Breitbart has examined in detail here. May: “This is the best possible deal, it's the only possible deal"
Juncker: "This is the best deal possible for Britain. This is the only deal possible". 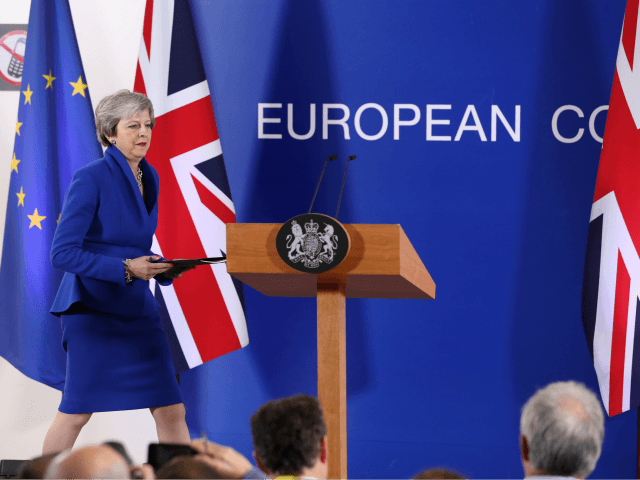 The “transition” was originally envisaged as a period in which a new relationship between the United Kingdom and the European Union would be implemented — but this has not happened, and it will instead be used as an extended negotiating period. Controversially, the withdrawal agreement makes provision for this transition to be extended for a further two years if a future relationship is not finalised, or for the UK and the EU to fall back on a divisive ‘backstop’ arrangement in which the UK would sign up to an EU-regulated “single customs territory” which largely duplicates the EU Customs Union. Under the backstop, the British province of Northern Ireland would have to meet additional obligations to the EU in order to keep the border with EU Ireland open — a measure which Northern Ireland’s Brexit-supporting Democratic Unionist Party (DUP) bitterly opposes, as it would undermine the United Kingdom’s integrity — while British fish would be excluded from the arrangements without a deal allowing EU trawlers continued access to British waters. The backstop deal would only cover trade in goods and agri-products, where the EU enjoys a massive export surplus with Britain, and not services, where Britain enjoys a surplus with the EU. Brexiteers believe it is highly unlikely that the EU will, in fact, negotiate a mutually beneficial trade agreement during the transition, as either extending it or resorting to the backstop — which Britain is not allowed to leave without the EU’s permission — are already so lopsided in its favour. Britain will also no longer be able to use the £39 billion+ divorce settlement Brussels has demanded as leverage, as payments will have already begun. French leader Emmanuel Macron wasted little time in gloating over the “leverage” which the deal hands to the EU, indicating that he would force the United Kingdom into the backstop if it fails to submit to adopt a fisheries agreement which essentially duplicates the EU Common Fisheries Policy (CFP) — which sees Brussels allocate less than half of Britain’s stocks to British fishermen, and has destroyed tens of thousands of jobs in coastal communities. Read more here. At the end of a largely ceremonial summit to rubberstamp the UK withdrawal agreement from the bloc and a draft text on the future relations, Jean-Claude Juncker made it clear the British House of Commons should not count on starting a renegotiation. Despite praising her own progress, the Prime Minister conceded that in any negotiation “you don’t get what you want” and have to be ready to compromise — picking up a common thread of criticism laid at her door that the number and level of concessions given to the European Union during negotiations well outweigh any positives. Senior Conservative backbencher Iain Duncan Smith was one of those criticising the Prime Minister’s deal Sunday morning, telling media outlets in a series of interviews that after so much had been given away to the European Union it would be difficult for him and others to vote to ratify the deal in Parliament. He said: “Right now the balance is definitely tilted against this being a deal that delivers what the government said they would deliver, which is leaving the European Union” and called on the Prime Minister to go back to EU negotiators and demand references to the so-called Northern Ireland backstop be removed. Addressing the calls on her to renegotiate from pro-Brexit Conservatives and others, the Prime Minister gave her own warning during Sunday’s press conference, remarking: “I am making the case for this deal to members of Parliament, and I think the point that Jean-Claude Juncker was making that has been reiterated by others, was that if people think somehow there’s another negotiation to be done, that isn’t the case.